Supplies: 1.25 inch Rug binding or twill tape-there is an adhesive variety, do not purchase this...we need to iron our labels and it simply won't work for our purposes. 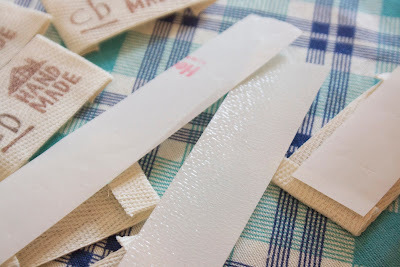 Begin by cutting your twill tape to desired length. It should extend about 1 inch past your text and logo, mine tend to be about 3 inches (If you're making a mass quantity I recommend cutting and stamping one before you cut them all and realize that it is too short). Once the ink has dried (usually just a couple of minutes), take a hot iron to them to heat set the ink. I have never had a problem with ink transferring to my iron, but if you are worried you may choose to use a pressing cloth. One side is a smooth paper, and the other side is a rough adhesive. 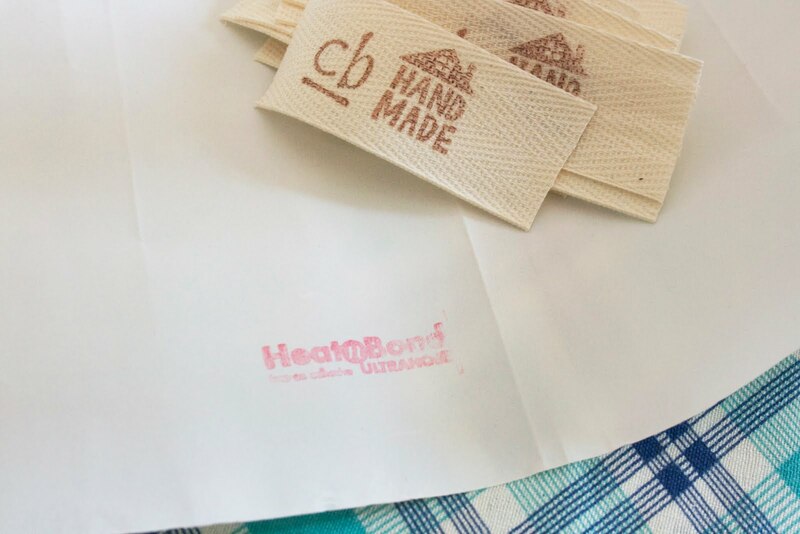 Cut to the length of your label and iron with steam the rough side of the Heat n' Bond to the back of your label. 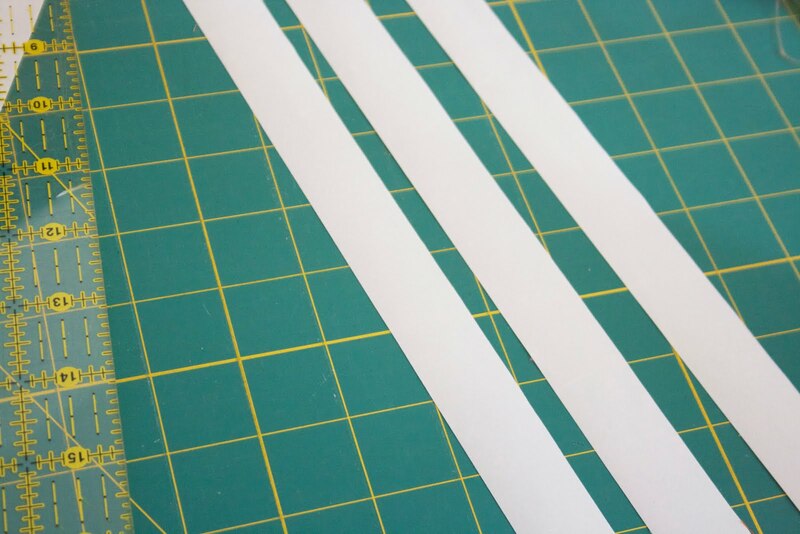 When you are ready to use your label simply peel off the paper to reveal the fusible surface. 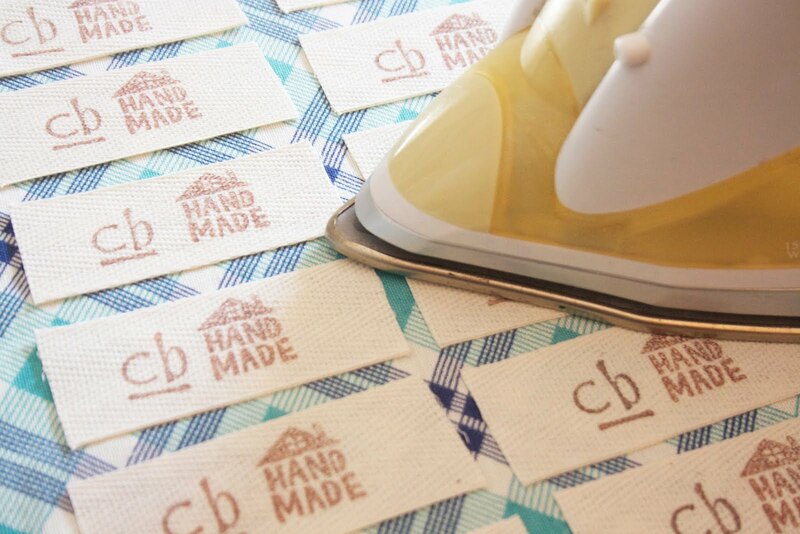 I use a steamy hot iron to attach the label to my products, I then stitch around the perimeter of the label to reinforce the hold. I have never encountered any problems with this method and enjoy the homespun look of them. I purchased my "Hand Made" stamp from The Small Object she has great stuff! I hope this tutorial is clear, let me know if there is something that I've missed. Good luck and go make something! Please Note: I do not make any claims regarding the longevity of the ink used in this method of label-making with repeated washings. These labels may not be suitable for garments or other items requiring routine machine washing. You may wish to seek out permanent stamp pads designed for use with fabric. Thank you for this tutorial!! I have been wanting labels for my quilts but was unsure of what to do. These labels are perfect! I can't wait to make some! I need make some of those! Love it. Thanks for the Tute! Perfect timing bc am about to make labels using an old pink penguin tutorial. Yours is easy-peasey however. And easy is good! perfectly written and clearly understandable tutorial. Cool tutorial! 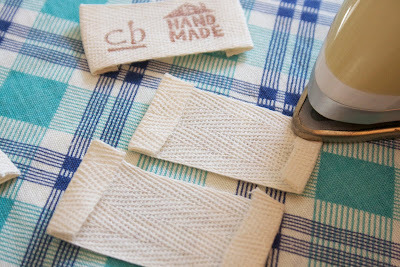 How fun to get a sneak peak inside your secret to these adorable labels. Love your technique, so thank you for sharing! 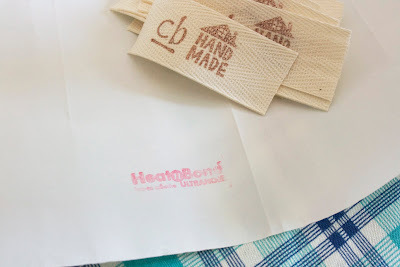 thanks for sharing your label-making method!! My JoAnns seems to refuse to carry twill tape - Thanks for the idea of Rug Binding! Thanks for the tutorial! I can't wait to make my own labels. Thank you for the wonderful tutorial! Can these labels be washed? Great tute...I'd really like to know what brand of ink you are using? Awesome! Thanks for your tutorial! can't say thanks enough. i have longed to make these but just did not have the first step on how to do it. Now i know and can do it my self. you could even us muslin. thanks again!! Thanks for this awesome info! What brand ink do you use? I use a regular old stamp pad intended for scrapbooking! Who knew? and "ColorBox" Fluid chalk inkpad. I have been successful with each brand, so I don't think it matters which brand you use. Good luck and stamp 'em up! Great tutorial and super cute labels!! Great tutorial! I am definitely going to give this a try as I am terribly remiss in labeling my quilts! Thanks! One question though...how to they with stand repetative washing and drying? Thank you for the tutorial - I'm on my way out the door to find some twill tape! 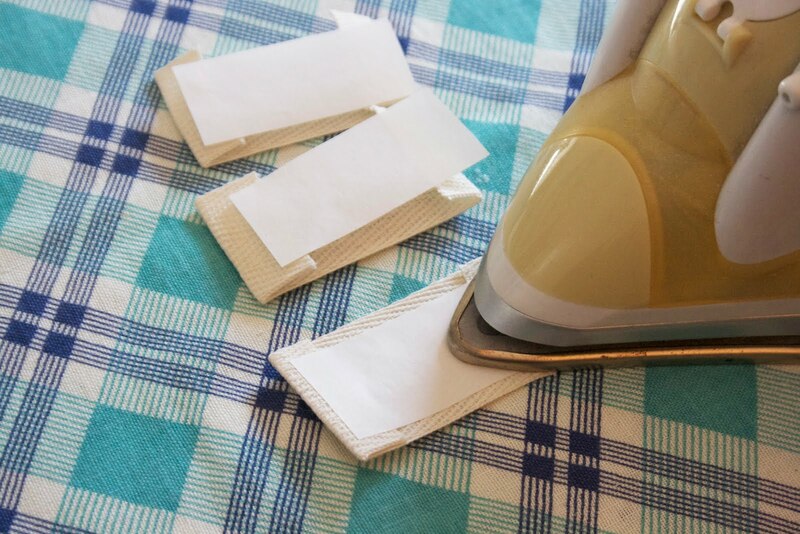 Have you ever had the ink was off the label after washing the quilt multiple times? Great tutorial!! I've always wanted to get my own labels but couldn't afford to get them printed by the 100s. I love how simple and sweet these labels are, definitely going to take some tips!! Thank you! I was wondering if these are washer safe or will the ink fade? Great tutorial, super cute labels! Awesome~~ I was also wanting to know about washing and drying numerious times.. Thank you so much. I am a newby and need all the help I can get. Where did you find the twill tape? We only have a Hobby Lobby and I did not find any there. Hello All, I hope you have a lot of success with these! Just stopping in to answer a couple of questions. Thank you for your help with this. I have wanted to put labels on my knitted products. I am excited to get to working on this project! 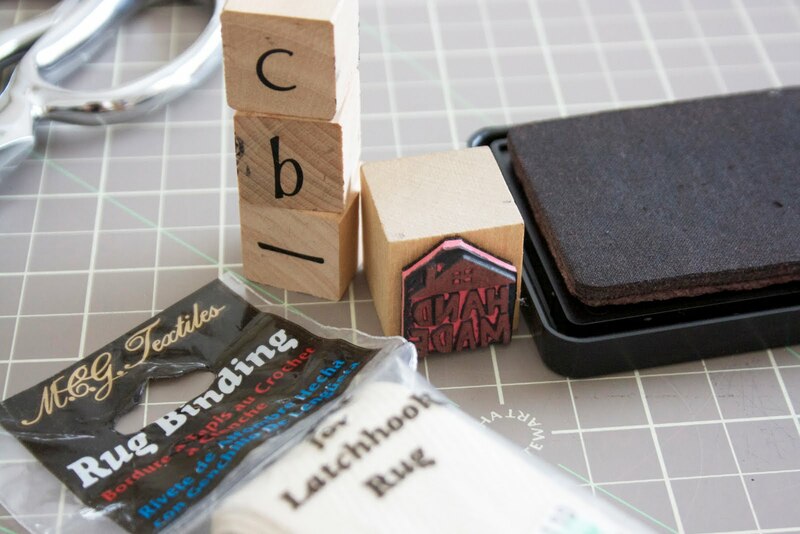 You can make your own stamp with you Cricut and the stamp blank material. Use your deep blade, slow, not too detailed works best. Mine turned out really good, I'm impressed!! FYI to anyone that wants to wash something with these labels on items... Using a regular stamp ink pad doesn't stay on through washing, it comes off completely. I'm getting one made for fabric and is permanent. I was just wondering if you could explain (clarify) how I can make a stamp using a cricut? For some reason I'm not understanding what you mean. :-P Thanks! i really love this tutorial. 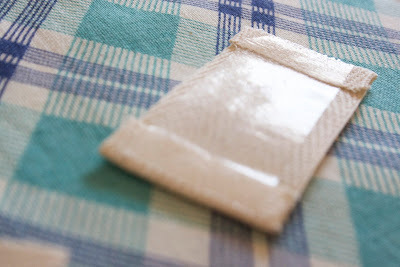 I have a question, what for fabric are you using to stamp on? Is it cotton fabric? Hope u answer my question. This tutorial is just perfect. Thanks so much. I found Bondex brand Twill Rug & Canvas Binding. I hope this will work though it has a shiny back. I found this at Joanns in the 'patches' area. They did not have the very specific Rug Binding by MCG Textiles. Any ideas if the type I found will work? Thanks! When stamping any clothing, I use a permanent ink pad specifically for fabric. Over time it will eventually fade but not nearly as fast as using a regular ink pad for items that will be routinely laundered. Something to think about. Shannon, thanks for the tip on the ink! I have not tried the brand of rug binding you found, so I can only speculate. It sounds like it has an adhesive on it so I would test it out on a fabric first and use a pressing cloth if you use an iron to avoid gumming up the plate of your iron. Let us know it works for you after you've tried it! Thanks for stopping by! Do you know what the cost per tag comes out to be? 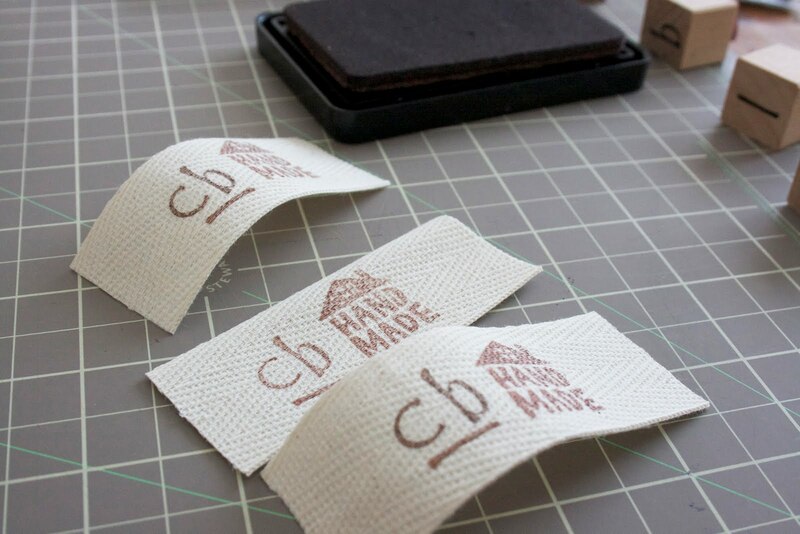 You can also design a tag on your computer and print it on the special paper which transfers to fabric. Follow the instructions on the packet. I found mind at Office Max. This is awesome! Thank you for posting. Great idea and looking forward to the next tutorial! 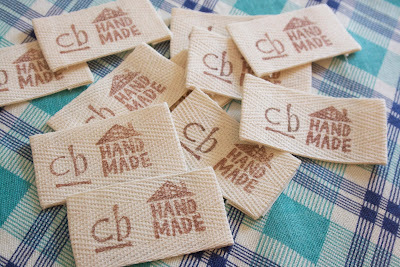 Love these type of fabric labels. Thank you for sharing your 'how-to' so we can all be as creative as you. Where did you get the "underscore" stamp? I've been looking for one and can't seem to find any! I really like your label tute. I've tried several label techniques and haven't really been happy with them. I'm going to give this a try AND share it with my readers on my next Friday Finds. Genius, I have been trying to figure out how to do that!!!! Thanks!!! Happy dance!!!!! This is really great . I like it . Yay! I love this idea more than any others I've tried or seen. I can't wait to get to the store. Thank you! I have wanted to make my own labels for years, but didn't know how and broke down and custom ordered them. Thank you so much for sharing how to do this. So wonderful! Thank you for the idea and the great tutorial! I would think a dye-based ink would be perfect, the pigment inks are slow-drying and aren't as stable to me. Maybe pre-washing the tape/binding would help by removing the sizing. I'm a paper-crafter but used to be a seamstress, we had permanent ink pens back in the day that needed heat-setting so that may help, as well. Thank you for posting this. I love making things but always want it to be a bit more professional like adding a label. I have such wonderful ideas of what I want to put on the labels. Sometimes I wonder if it's more about the labels than the actual piece I am making. I love homemade stuff. Just has so much more value than a commercially sausaged out thing from the shops. Joann's has this ink that's permanent and waterproof for paper and fabric.